Finally, i reach the end of my study in LNG Academy..
yes.. its our graduation day! 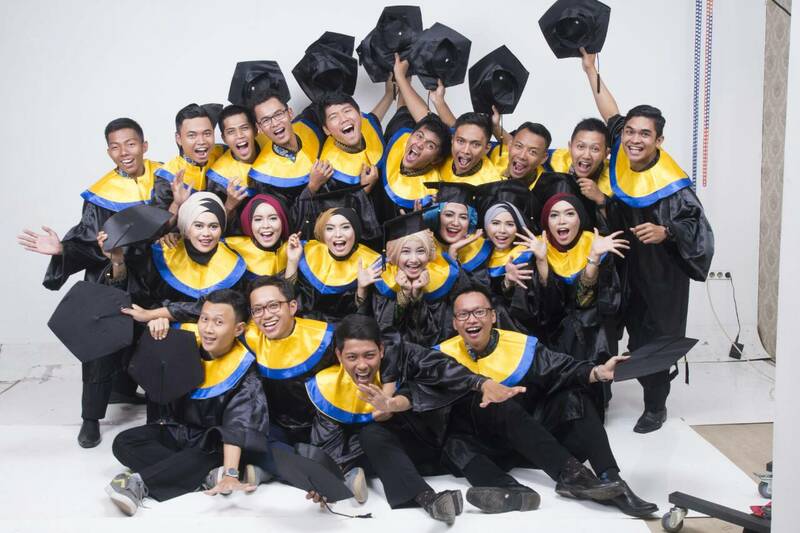 its start on 22nd September, when LNG Academy 2nd batch goes to Depok for five days to attend 31st graduation ceremony, yes.. our graduation ceremony!! From Bontang to Balikpapan we use patas bus because the haze of the burning forest disaster during this time in Sumatra and Kalimantan block the view of the airplane, so its not safe for flight. From Balikpapan to Jakarta the weather is normal and there is no haze in Java and Java sea, so its safe for a normal flight. In Jakarta we goes to Depok using damri bus. in Depok we choose Margonda Residence Apartments as accommodations for five days because the location is in the margonda raya street, very close to Universitas Indonesia Complex. the Graduation Ceremony is set on 26th September, but one day earlier, there is some "dry-run" of the ceremony. The agenda of the ceremony is take a picture with the director of Politeknik Negeri Jakarta, mr. Abdillah, S.E., M.Si. and the scenario is when the director is graduating student by flipping the rope of the mortarboard from left to right. After all of the graduated students are photographed, we take a break to Jumuah pray and the agenda continues to dry run, this agenda purposes is to explaining the agenda of the graduate ceremony tomorrow. In this dry run, graduated student wardrobe is batik and black long pants, and usually every major wears different batik depends on their uniform. LNG Academy as the independent major in Politeknik Negeri Jakarta wears black batik with east Kalimantan motive. And on 26th September is the D-day! We wear a suit and toga to graduation ceremony. 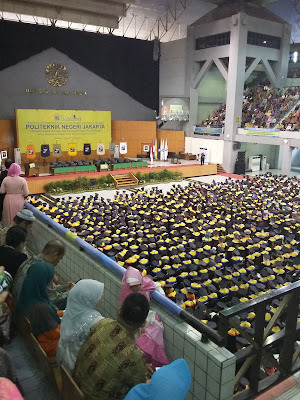 The ceremony is taken in Balairung Universitas Indonesia. The attendants are graduate student and their parents. The ceremony begins with all graduate students enters the ceremony arena based on their major. LNG Academy with mechanical engineering major. There are seven major in Politeknik Negeri Jakarta: Electrical Engineering, Mechanical Engineering, Civil Engineering, Accountant, Printing and Publicity, Computer and Information, and Marketing. After all of the graduate student enters the arena, the Director and board of senate enters the arena with backsound "Godeamus Igitur" sing by the choir. After that, all attendants sing Indonesia Raya song by standing of couse... after that the choir of politeknik negeri jakarta sings hymne and mars of politeknik negeri jakarta. The two songs that we as LNG Academy student never heard before because the first and second batch of LNG Academy doesn't follow the orientation activities of politeknik negeri jakarta :p well.. its not our fault right? Afterwards, the main agenda begins, the director inaugurating the all of graduate student by symbolism inaugurating the best graduate student of this 31st graduation ceremony. And finnaly, the rope of our mortarboard turns right! And finnaly we deserve to get the title of "diploma degree" or in Indonesian called "Ahli madya". After Inauguration, the agenda continues to the Director congratulating the best student of every sub-major in seven major of politeknik negeri jakarta, and of course, as the sub-major, LNG Academy has the best student, that is Sariwati, our friends, the small one :p..
And we swore an oath, the graduate student oath led by the best of the best graduate student. After swore an oath, we sing "Padamu Negeri" song. Officially the Ceremony is over but there is an entertainment by graduate student by sing a popular song. And then, senate is dismissed, the Director and the boards leave the arena of ceremony. And then... we throw our mortarboards as the expression of our happiness. Happy graduation folks!! thats all folks, thats our graduation, how about yours? 4 Responses to "31st Graduation Ceremony of Politeknik Negeri Jakarta (Jakarta State Polytechnics)"
Congrats for your grads :D Sedikit envy ngeliat foto2 wisudamu yg bertebaran di sosmed. tp paling enggak jadi penyemangat buat wisuda dan selesaiin skripsi sesegera mungkin!! Ah yaaa~ kalo ada waktu luang, visit back my blog dit? Btw udah ku follow ya blogmu sher, keep posting!